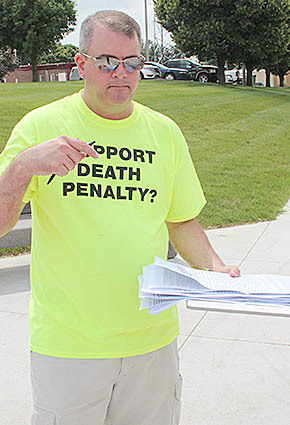 Anthony Neidhardt of Gretna, an Albion native, was circulating a petition for the death penalty vote on the sidewalk just outside the Boone County Courthouse grounds last Thursday afternoon. He reported that he ran out of petitions and about 150 people had signed in Albion. Details in the July 8 Albion News Print and E-Edition.